-- Hold the pistol upright in the pocket for proper presentation, so it can be gripped quickly and correctly. -- Enclose the triggerguard so that a stray finger doesn't catch it in your pocket. -- Enclose the muzzle to keep out the detritus. -- Cover the safety and expose the magazine release. -- Stay in the pocket as you draw the pistol. -- Break up the outline of the pistol in your pocket. Our standard pocket slip does all these things. 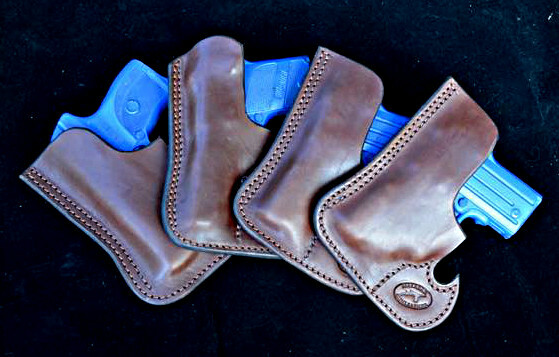 They are made from 8-ounce bullhide that was cooked in tallows and waxes to make it waterproof. 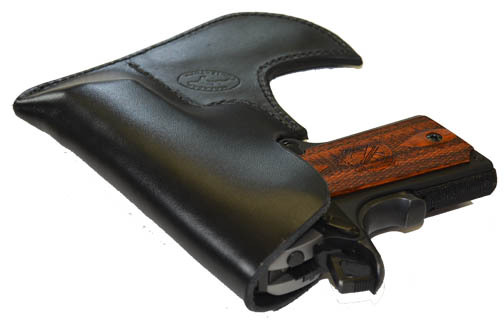 They are individually fitted to specific models of pistols for a perfect fit. 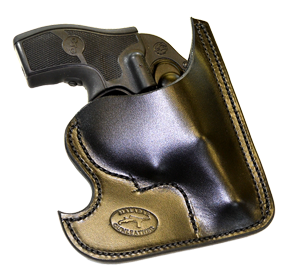 Because the leather is waterproof, it cannot be molded the way that most of our holsters are. These can be made in other styles, other leathers, and with wallet flaps on request. 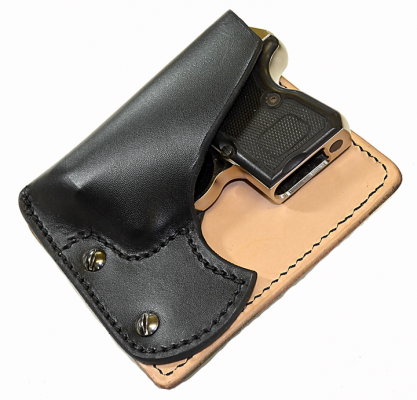 Also available for small revolvers and a cargo-pocket holster for 3-inch 1911s. 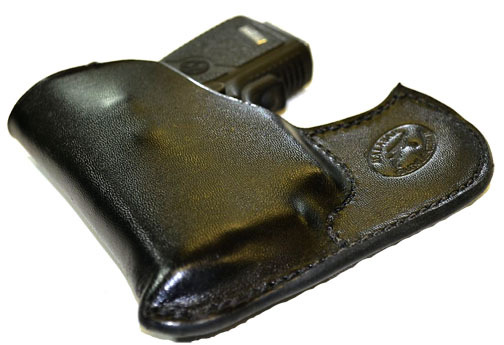 Pricing: $25 in black, waterproof bullhide or Hermann Oak cowhide, for subcompact autos; $35 in black, waterproof leather or Hermann Oak cowhide for small revolvers; $35 in black, waterproof leather or Hermann Oak cowhide for larger autos; $15 extra for two-layer, stitched, wallet flap.